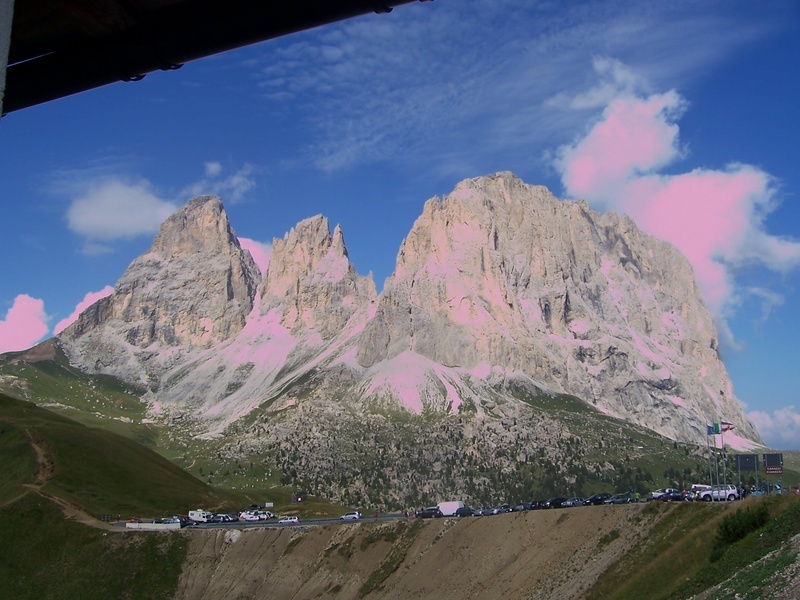 My trip through the Dolomites was perhaps the toughest of all the trips I have undertaken. There were many spectacular moments but it was a bit beyond my level of fitness at the time. If you are fully tuned up, however, it is a great place to enjoy. I flew into Venice from Leeds, reassembled my bike, stored my box and made the short ride from the airport to Mestre. It is possible to follow a fairly quiet route. After breakfast at the hotel I set off from Belluno. I followed the busy SR204 to Ponte Mas (10km), before moving onto very quiet roads, which took me to Lago del Mis. The ride from here to Agordo was an unexpected highlight of the trip. Traffic free, to the point of feeling lonely, there was spectacular scenery. The road passes through a series of mercifully short unlit tunnels and then is hemmed in by a gorge, which at many points blocked reception to my Garmin unit. Once passed the lake, the road climbs some 500m over the next 10kms, before dropping again into Agordo, 40km into the trip. I stopped for a drink and a bite to eat in Agordo, which was very crowded, and then took the SR203 to Caprile. The 22km to Caprile is on a gradual incline, climbing 400m. The road was a bit fast and busy for my liking and also involved a long tunnel, so I was glad to reach the turn off. This, however, is the point at which the real work begins. The next 15kms involves a 1100m climb up Marmolada. It's pretty relentless and unfortunately I missed the turn off to the Sottogurda Gorge, which is I believe is closed to traffic but open to bikes. I stayed on the main road, passing ski lifts on the stark mountainside, as it became increasingly difficult,with gradients above 10% for much of the last 5kms. Eventually I made it to the Passo de Fedaia at 2057m altitude. From here, I hurtled down the 14kms to Canazei. There are a number of reasonably well lit tunnels towards the top but I put a light on to go through. After hitting a bump, my front light flew off and smashed beyond repair. Otherwise it was a safe cruise all the way into Canazei. Canazei was packed. I stayed at the La Perla Hotel, which required me to take half board. The room was pleasant enough but the food uninspiring. No matter, I was tired and needed to revive for the next hard day. There are different ways to accomplish this trip. I chose to go over the Sella, Gardena and Valparola passes, making for a relatively short but tough day. The climb to Sella begins immediately, rising nearly 800m in the first 12kms before hitting the pass at 2200m. The road was busy with holiday traffic, which took a little of the edge off the ride. It was very odd to be up at 2200m in a traffic jam at the pass. When the SP24 merges with the SP48, the traffic pick up again. The last bit of the day was a little frustrating, braking in traffic as I descended all the way to Cortina. Cortina itself is a pretty place, very busy in August with Italian tourists. I stayed for two nights at the Hotel Montana, centrally located, fairly basic for the price but fine. I ate out at a pretty expensive restaurant that evening but it was so unmemorable, I can't recall its name. The benefit of staying two nights was the chance to ride unencumbered by panniers the following day on the toughest route I had ever done. Unfortunately, I didn't carry my camera. Retracing my steps for few kilometers, I then took the road to the Giau Pass(2236m). The road was quiet in comparison to some of the others I had taken and very spectacular. From Cortina it is some 17km, rising over 1000m. At the top of the pass is a large cafe, where despite the lack of traffic, there were plenty of cars parked. I had a drink and a snack and then made the dramatic descent.The road is very well surfaced but with lots of sharp hairpins and quite a test. In a flash, nearly all the height gain was lost and I was making the second ascent of the day to the Passo Staulanza, although this time to a relatively modest 1773m. Exhausted, I stopped for a long lunch at the restaurant at the top of the pass. From the pass, there is an 18km descent of nearly a 1000m to Forno di Zoldo. 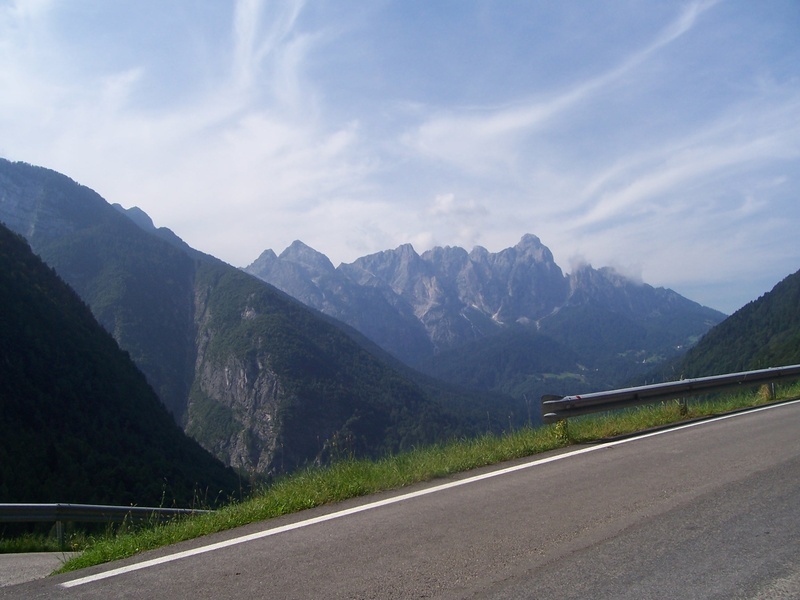 I turned left off the main road to follow a beautiful lonely road to the Cibiana Pass. It was very hot and the second half of the climb is steep, between 8 and 10%, touching 15%. It was a relief to get to the top and get a drink. The 10km climb, with 800m ascent, was matched by the descent, with the road chargng down to meet the main SS51 road. The SS51 is busy, so thankfully there is a dedicated bike path to follow. Having seen very few cyclists all day, this bike path was well used, particularly by families. Having put three major climbs in, even the very gradual 20km rise into Cortina was tough. I arrived back at the hotel feeling more physically exhausted than I could ever remember but it had been a fantastic ride. I had a simple pizza that evening and a couple of drinks in a good wine bar. It was my intention to cycle to Lienz. 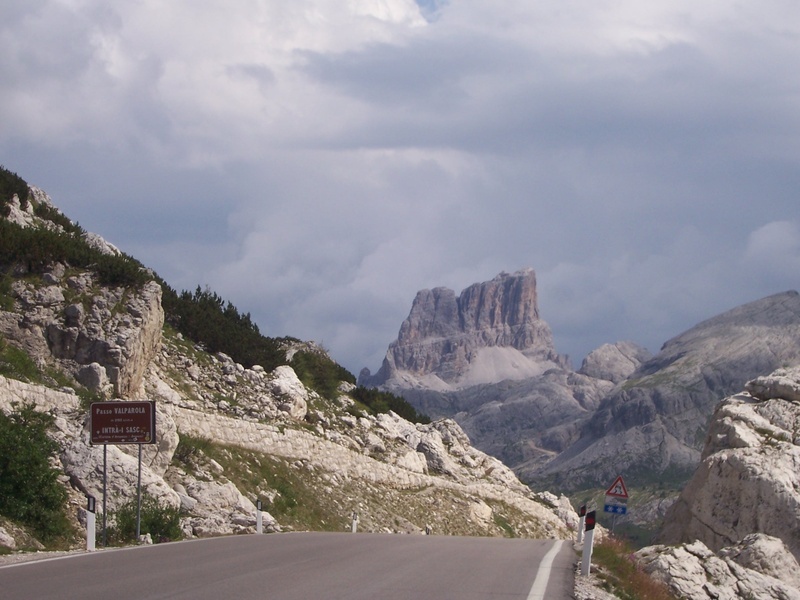 I rode north from Cortina along the SS51, which early in the morning, along that stretch, was quiet. Although the road climbs for 16kms, it was a gentle ascent. The road passes a series of lakes, culminating at the Lago di Lando. The road then continues a descent all the way to San Candido. It had been cloudy all morning but descending I could see dark thunder clouds in the distance. I put on some gear and went as fast I could before it started to rain. The rain began just as I was entering the town. I headed for the train station and got there just in time as the heavens opened. I abandoned the idea of taking the cycle path, which goes all the way to Lienz, in favour of the train. I made the right decision. The rain didn't relent for hours. It was literally bouncing off the pavements. I stayed at the Romantikhotel Traube, which was very comfortable. There is a swimming pool on the top floor, with some good views. The rain eventually stopped and I had look around the town, which is very pleasant. I had a good meal at La Taverna in the basement of the hotel. It was full and had a very friendly staff. 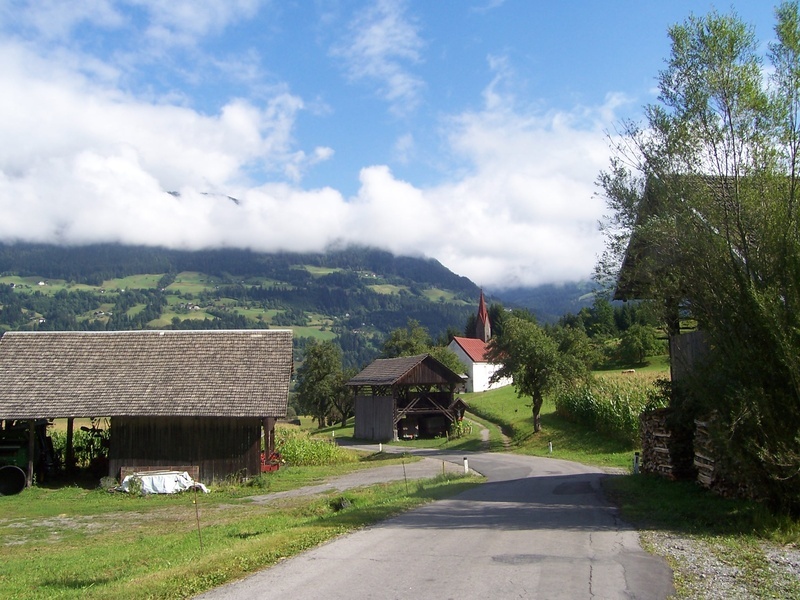 My original intention had been to ride the Grossglockner to Zell am See but the weather was uncertain and I didn't feel I could confidently take it on. I opted instead to take a bike path from Lienz to Spittal an der Drau. Mainly downhill, it was a good contrast to the early part of the trip, taking me through undemanding but very pretty countryside. The villages and houses along the way were immaculately kept. There were a few stetches of the RI bike path which were off road and, given the rain of the day before, I had to pick my way carefully over some waterlogged ground at some points. All in all, however, it was an easy day. I took the train to Villach and stayed at the Romantik Post Hotel and and ate at the Travestere restaurant. I took the train from Villach to Venice the next day, staying in Mestre. 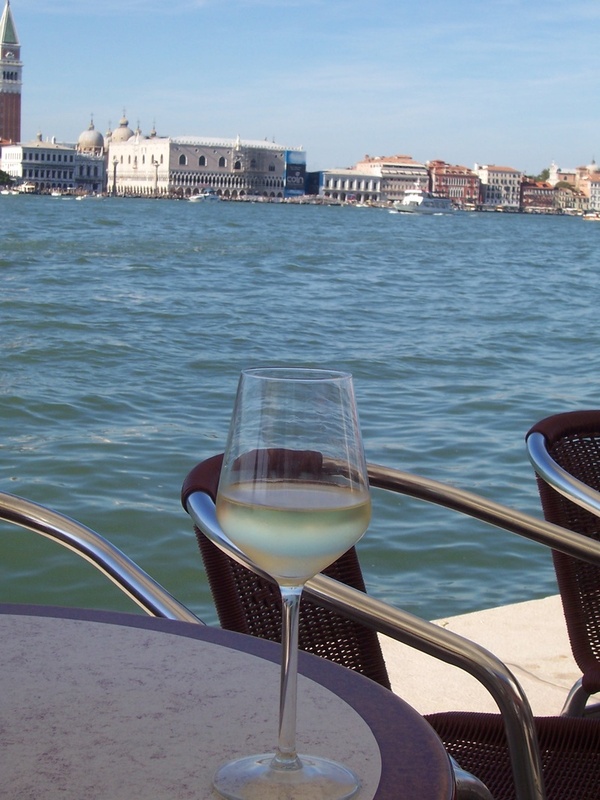 I went into Venice in the afternoon and stayed until late evening. Parts are overwhelmingly full but it is easy to get away from the crowds and find oneself in quiet squares which would be the centrepiece of most towns. I toasted my trip with a couple of glasses of prosecco. The next morning I rode to the airport, packed by bike back up and made the journey back to Leeds. I have mixed feelings about this trip. The round trip ride from Cortina is among the best rides I have done and some of the scenery on the other days in the dolomites was spectacular. The area, however, was a little too busy for my tastes. Perhaps more important, I wasn't really fit enough to properly get through this trip. The first three days really took it out of me, so I didn't complete all the rides I had planned. Choose a quieter time and get fit and it will be a great trip.